Frenchie’s monologue from “Straight Stitching” in 60 Seconds to Shine: 221 One-Minute Monologues for Women, Vol. 2, edited by Irene Ziegler Aston and John Capecci, Smith and Kraus Publishers, 2006. ISBN 1575254018. Order from Smith and Kraus. Hansel and Gretel, Theatrefolk, 2005. ISBN 1-894870-53-0. Order from Theatrefolk. 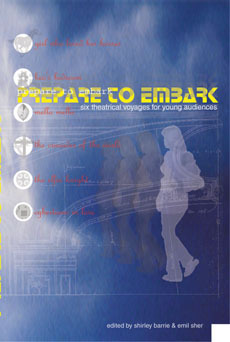 Prepare to Embark: Six Theatrical Voyages for Young Audiences. Edited by Shirley Barrie and Emil Sher. Playwrights Canada Press. 2002. ISBN 0-88754-652-8. Order from the Playwrights Guild of Canada. The six plays featured in this collection offer endless ways to engage students in middle grades. Girl Who Loved Her Horses by acclaimed aboriginal playwright Drew Hayden Taylor – set on a reserve, and imaginatively affirming the importance of creativity in a world that can be hard. Beo’s Bedroom by Ned Dickens – written in verse, this is a modern re-imagining of Beowulf, an old English poem first told over a thousand years ago. Mella Mella by Gail Nyoka – who uses music, masks, choreography, mime and shadow puppets to bring an African folk tale to life. Crusader of the World by Arthur Milner – a very contemporary story in which Shelley visits a third world country and discovers that she doesn’t have all the answers. The Elfin Knight by Christine Foster – inspired by Celtic folk tales, but set in Cape Breton and first performed outside in a natural amphitheatre. Cyberteens in Love by Matthew Decter – a leap into a very different and dark future which challenges readers to think about what it means to be human. CANADIAN MATERIALS October 2004. For the full review. Carrying the Calf, Theatrefolk. 2003. ISBN 1-894870-36-0. Order from Theatrefolk. “Een Heksenbrouwsel,” trans. Jan Dullemond, Internet Dionysia, Holland, 1999. Excerpts from “Carrying the Calf” and “I am Marguerite” in Two For the Show, edited by Brian Kennedy. 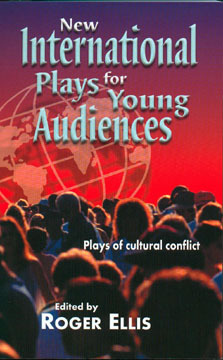 Playwrights Canada Press, 1999. ISBN 0-88754-579-3. Order from the Playwrights Guild of Canada. Excerpt from “The Women’s Circle Project,” and “Aiming for the Centre,” Canadian Theatre Review, No. 69, Winter, 1991. “Small Triumphs,” in Glancing Fires, ed. Lesley Saunders, Women’s Press, 1987. “Organizing the Fringe,” in Canadian Theatre Review, No. 14, Spring, 1977.